Elear offers the world’s first full range and fully open back loudspeaker built-in to a pair of headphones. Additionally, they are made from an aluminum-magnesium blend, in a formed shape, unique to Focal with the company’s brand new “M” shape dome. This new dome shape has originated from the research performed during the Utopia headphone project that will offer the highest quality sound, while avoiding potential avenues of distortion. The acoustic quality of this exclusive solution allowed Focal to avoid the use of any crossover or passive filtering process in order to achieve a frequency response from 5Hz to 23kHz. The result is thus impressively realistic, making the headphones virtually disappear and providing listeners with a truly unique high-fidelity audio experience. Elear also benefits from the R&D done on Utopia. With regards to mechanical design, the rotation traditionally included on the yoke has been moved into the headband to ensure the total purity of the design. The microfiber fabric, used on the cushions, offers a true comfort for all head shapes and sizes – a quality that is mandatory for long listening sessions. Designed to display your Focal Clear or Elear headphones. Designed in stainless steel with a s.. 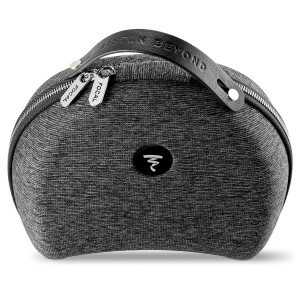 This rigid carrying case is an elegant way of transporting Focal Utopia or Elear headphones and a ca..